according the the size chart my bust was a size 4 and my waist a size 6, so I cut a 4 on top and then graded it up to a size 6 after the bust darts. It actually fitted quite well once I took in the side seams under the bust dart (to a size 2 ?!?). 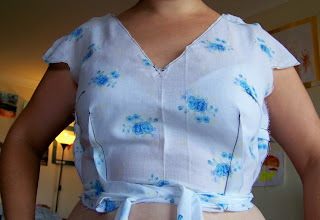 I wasn't all that impressed with the neckline, so it is now v-shaped instead. The back was very baggy and had lots of fabric folds everywhere. I was feeling quite defeated, because no matter how much I took out it didn't really work. 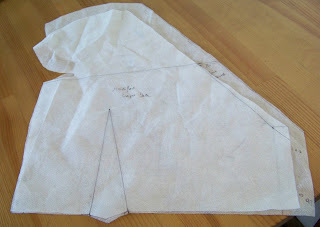 Gridlock is a substantial fabric, add to that the lining, I almost gave up until I looked at the pattern pieces. There is a lot ease in the shoulder section and I seem to have a small back (judging by previous dress and shirt endeavours), so I copied the arm/ shoulder section from the front to the back. Below is a picture of the modified back laid atop the original back. 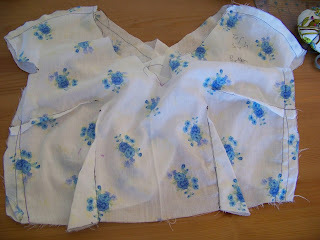 It now has the modified side seams, the changed back and I took another 1/4 inch out of the shoulder seams. This picture still shows a fold in the front under the girls, but after trying it with a variety of bras, I decided to stop messing with it. I added the waist tie to get a better idea of the fit. I think the back is much better. I wore it around the house for a few hours to get an idea whether I cut out too much ease, but it seemed fine. 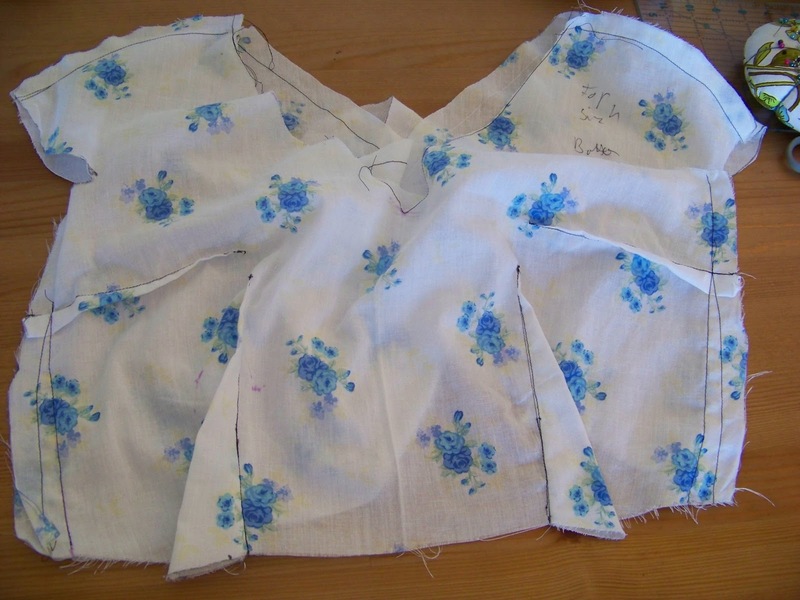 Now that I cut out the bodice and the lining though, I wonder whether I left enough ease to compensate for the fact the the gridlock fabric and lining will be much thicker then the ex-table cloth that I used a s a muslin ... sigh, well, we'll see. 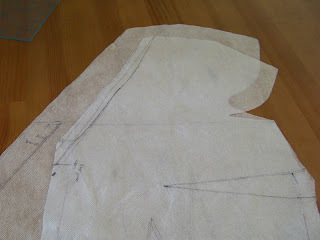 Idea: Could you cut the side seams a bit wider, just in case?